It was wonderful to be able to celebrate All Saints Day with the office for the New Evangelization of Youth and Young Adults. Many of the activities of the ONE office are held in the North End. However, this month the Mass and the reception were held at St. Paul’s in Cambridge. They are going to places where they can reach a lot of young people and, obviously, St. Paul’s near Harvard Square is one of those places. 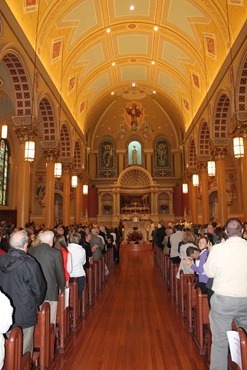 The Boston Archdiocesan Choir School sang for us and it was a very packed church. I was so pleased to see so many students from a variety of universities present for the Mass. 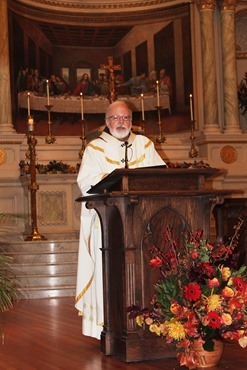 The following day was, of course, All Souls Day and I always like to observe the tradition of celebrating three Masses on that day. The first one was a Cathedral Parish Mass, and it was attended by members of the Community of Sant’Egidio including Joshua Marmol who is the local leader. Afterwards they had breakfast with me. They presented me with a book and spoke with me about their work, particularly about their efforts to abolish the death penalty, caring for people in nursing homes and also their advocacy regarding religious freedom. They also highlighted the martyrs who died for their faith within the last year. 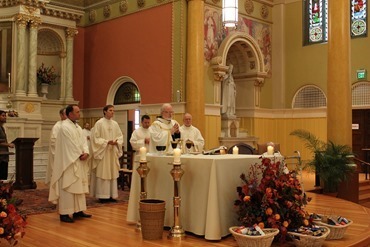 That afternoon, I attended the Mass for the class of permanent deacons who were receiving candidacy. Candidacy of course replaces the old right of tonsure but it is one more step on the way to ordination and it reminds people of the seriousness with which they must proceed towards the goal of ordination, preparing ourselves spiritually, intellectually and pastorally and continuing the process of discernment. The Permanent Diaconate Program is a very important priority in the archdiocese and we are grateful for the many people involved in their formation, particularly the head of the program Deacon Dan Burns. Afterwards there was a luncheon for them. 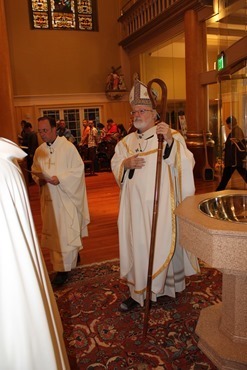 My third mass of the day was a private Mass celebrated at the Chapel of the Cathedral rectory. Sunday, I went to Saint Cecilia Parish in Boston to join in the celebration of their 125th anniversary. In my homily I commented on how this parish would have started in a time of great growth in the Church when it was founded by Irish servant girls. I commented on the fact that my parish in Washington was made up of domestic workers from Latin America. So, I told them I felt as though I had some insight into what it would have been like founding this church. Here you would have had these women doing very difficult work, poorly remunerated, and most probably sending money back to their families. Yet, at the same time, they were sacrificing to build this magnificent temple. And, of course, all this took place at a time when it was not easy to be a Catholic in Boston. What a testimony it was to their generosity and faith. That afternoon I went to celebrate confirmations at Saint Michael Parish in Lowell were Father Tom Rossi and Father Al Capone are in ministry. There were about 16 young people confirmed. I was very impressed at how well prepared the young people were. Father Rossi and a team of volunteers run the confirmation program. I found the young people very engaged and he has done a great job with the program. 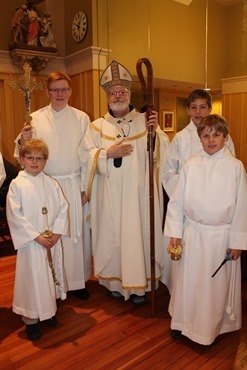 Confirmation is always such an important moment in the life of the Church and I was very happy to be with them. Then, on Tuesday, I attended a breakfast to kick-off the planning for the next Catholic Schools Foundation Inner City Scholarship Fund Dinner that will take place on April 3rd, 2014 at the Copley Marriott Hotel. Among the many volunteers and organizers we were joined by Jay Hooley, who is the dinner chairman this year; Peter Lynch, the founder of the ICSF; Mary Moran, our acting superintendent of Catholic Schools; and Michael Reardon, the president of the Catholic Schools Foundation. Then, in the evening, I had one of my regular bimonthly meetings with priests who have been ordained within the last five years. 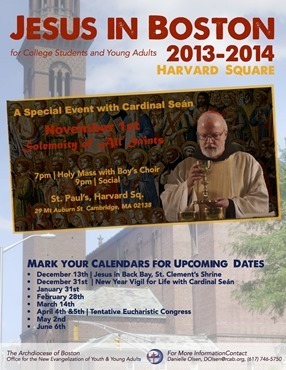 We always have a Holy Hour followed by Mass and then a conversation about priestly spirituality and ministry. This time, we decided to go through the questions that have been sent out to the dioceses of the world in preparation for the upcoming Synod on Marriage and the Family. It was a very interesting exchange and the men had a lot of interesting ideas. We will certainly communicate those to the Holy Father! There has been some controversy surrounding the questions, as if the Church were taking a survey to see what its teaching should be. I do not feel that is the case at all. It is more like “taking the temperature” to see how the Church’s teaching is being communicated, accepted and understood as well as to see what pastoral programs, strategies and outreach are in place to help marriage and the family in today’s world. Of course, it also elicits suggestions around these issues. It is not that the teachings of the Church are “up for grabs.” Instead, I think the Synod will try to assess how successful we are in communicating the richness of the Church’s teaching around marriage and family. It will also try to reflect on some of the more problematic areas that the Church faces in today’s world on these issues. 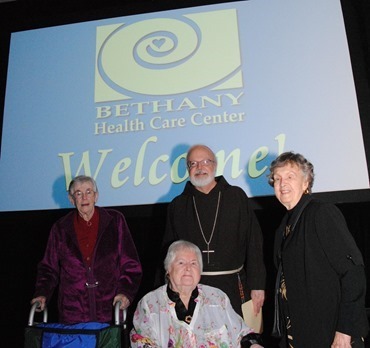 The Sisters of St. Joseph, who are celebrating their 140th anniversary, held their annual fundraiser for Bethany Healthcare Center Wednesday evening. The center is run by the Sisters of St. Joseph and many of their retired sisters reside there. The sisters are doing extraordinary job there and it has been rated one of the best healthcare centers in the United States. This year, the honoree at the dinner was Jack Shaughnessy. 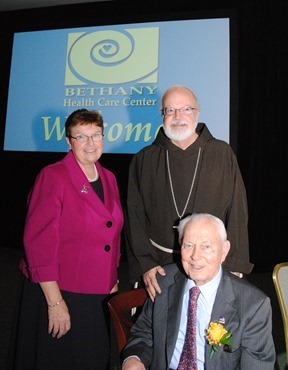 Jack is a man who has tirelessly supported many Catholic causes, so any opportunity to honor him is a chance to hold up the example of his life, of faith, his beautiful family and his life of generosity to the Catholic Church and to so many of the ministries and social services of the archdiocese. I congratulate the Sisters on choosing such an outstanding Catholic to be the honoree at their annual gala.